How Can A Dental Implant In Jacksonville Benefit Me? Tooth loss can ruin your facial appearance, jaw bone size and day to day speech and eating. 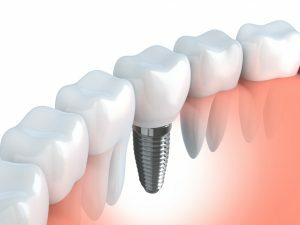 When decay, oral injury, congenital defect or gum disease robs an individual of one or more teeth, Dr. Larry Young may recommend a dental implant in his Jacksonville practice. Stable and realistic in appearance and function, dental implants are true artificial teeth. No other tooth replacement option is quite like this modern dental marvel. Through oral examination, X-rays and other kinds of imaging, Dr. Young carefully checks an individual’s oral health and jaw bone integrity to decide if he or she is a good candidate for the procedure. With the decision made, Dr. Young refers the individual to a trusted periodontal surgeon for placement of the Straumann dental implant device. The surgeon drills a small pilot hole in the bone and screws in the implant, suturing the site closed. After several weeks of healing to ensure the device has fully integrated to the jaw, your dentist in Jacksonville bonds the extension post to the implant and attaches the customized porcelain crown. Dental implants are incredibly stable. Through a natural process called osseointegration, titanium dental implants fuse right to human bone. As people bite and chew, the pressure exerted on the implant transfers to the jaw, exercising and strengthening it. Dental implants are realistic. Whether used to replace one tooth or to anchor full fixed or removable dentures, these prosthetics look and function like real teeth. Patients that oral hygiene is as easy as brushing, flossing and getting professional cleanings semi-annually at Larry Young Dental. Dental implants are successful. The American Academy of Osseointegration reports placement and retention rates of well over 90 percent. However, smoking and poor oral hygiene may threaten long-term retention. Dental implants allow people to enjoy their healthy diets without the dietary restrictions typical of conventional tooth replacements. Dr. Young and his team love talking about dental implants. If you are considering getting one or more implants, don’t delay. Contact Larry Young Dental today to arrange a smile consultation. Comments Off on How Can A Dental Implant In Jacksonville Benefit Me?